* Two of these pack will give you full coverage on your Land Rover Defender including the roof. Dynamat Xtreme quiets annoying road noise, improves a speaker’s dynamic range, and makes for a more comfortable driving experience. You can quiet down the noise, and get better sound. Sound Proofing kits for your Defender - Dynamat Xtreme - offering complete interior protection. The Dynamat Xtreme Mega Pak is the perfect for any large job. With the Mega Pak you get 9 of our largest sheets of Dynamat Xtreme to damp vibrations, quiet the noise, and get a more solid ride. Install with one of our Dynamat Rollers, and discover the Dynamat difference. 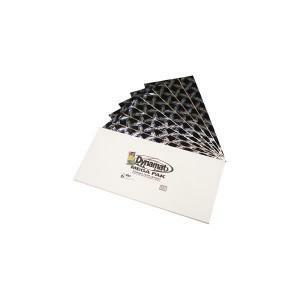 Contents: (9) 24″x 48″ (609mm x 1219mm) sheets of Dynamat Xtreme. Application: Use on rear tub, doors, floors and the roof of your Defender to get more bass, more music, lower road noise and better sound.